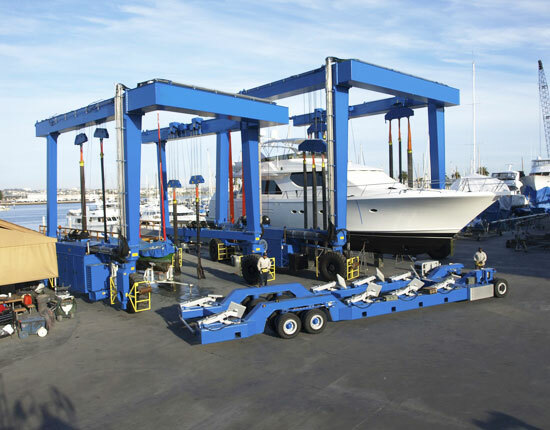 Travel lift crane is a piece of marine lift designed and built for the maximum safety and efficiency of boat handling in shipyards, harbors, docks and yacht clubs. It is capable of lifting and moving large-sized ships going up to 1200 tons. 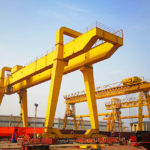 The travel lift gantry crane from Ellsen can be engineered according to the size, shape and weight of your boats as well as the size of specifically designed wharfs. 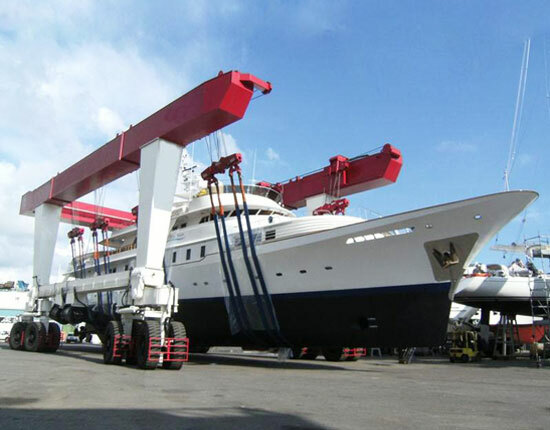 In terms of boat handling, the travel lift cranes deliver a few main functions, hauling a boat in and out of water, transferring it in the yard area for repairing and maintenance and arranging vessels in rows to improve the utilization of limited yard space. The marine travel lift crane supplied by our company is built with sturdy structure for a longer life and more stable movement. As a sort of boat handling equipment, the travel lift crane is meant to lift and transport varied ships quickly and safely. 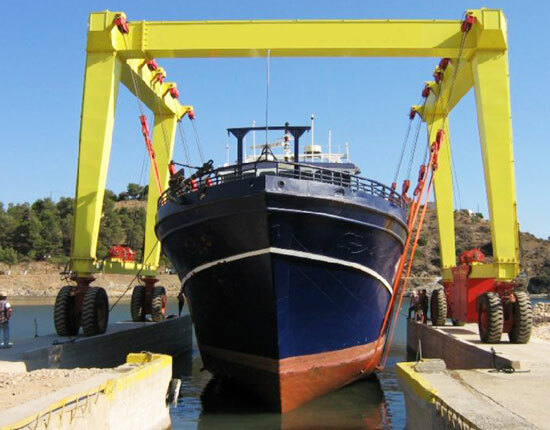 When it comes to the boat lift crane configurations, there are a number of specifications for your choice regarding the rated lifting capacity, inside clear width, wheelbase, span, inside clear height, overall height, overall width, minimum turning radius, lifting points and so on. Lifting capacity: our boat crane lift covers a range of capacity for small to heavy duty lifting, such as 25 tons, 50 tons, 100 tons, 200 tons, 500 tons, 1000 tons and even beyond. Overall size: available in custom design in height and width. The variable-span design also provides flexible adjustment according to the width of the boat. Lifting points: the lifting points and number of straps are configured according to the specific vessels to be hauled. Movable lifting points deliver convenient adjustment so as to keep the multiple lifting points raising synchronously. Hoisting mechanism: adopt load-sensitive hydraulic system. Travelling mechanism: it generally adopts full hydraulic transmission system. In the case of small tonnage vessel handling, we provide an economical all-electric drive design if needed. Maximum slop: when fully loaded, the boat lift crane can travel with 4% maximum slope. Steering mode: available in multiple modes for different working needs, including straight travelling, oblique travelling, 90 degree steering, fixing axle steering, Ackermann steering and more. Control system: it comes in two main configurations, remote control and cabin control. Additionally, if the given technical parameters cannot meet your needs, we provide custom design and configuration. For further information, contact Ellsen professional engineers online now! Our travel hoist uses articulated main and end beams to eliminate structural stress when travelling on uneven ground surfaces. Use stainless steel tubing and components to prevent them from corroding in salt-water environments. 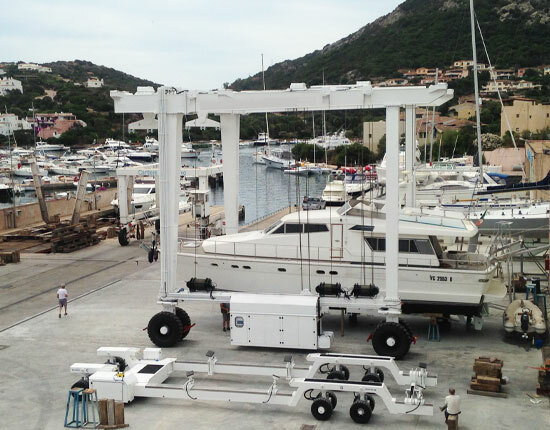 Our boat hoist is built with beam formed structure for more rigid construction and longer life. Painted with superior primer and top coat, our travel lift crane provides delicate appearance, excellent corrosion resistance and long working life. Our crane is fitted with soft but sturdy slings to prevent hull damage and balance the load equally. Slings can be adjusted to a proper position in order to improve the load placement. Boat Lift Remote Control And Cabin Control, Which Is Right For You? In terms of travel lift control system, there are two main modes, remote control and cabin control. Each type has its own unique features and advantages. The remote control travel lift crane is ideal for light duty boat handling since it has relatively low cost and easy operation. Cabin control is commonly found in large tonnage boat handling equipment for safe operation. In this control system, a driver’s cabin is usually affixed to the crane. The selection of control mode is largely determined by the crane capacity, size, ease of use, your budget and other factors. If you are unsure as to which operation mode is right for your crane, please feel free to contact us online. In marine-duty applications, the travel lift crane is exceedingly heavy and sometimes dangerous to work with, so it is essential to improve the safety and reliability of the equipment in severe marine environments. 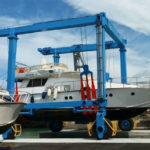 For boat crane owners, they need to ensure the equipment is in good mechanical construction and working condition. Thus it is of great importance to choose a reliable and reputable travel lift manufacturer and supplier. They should also make sure the crane is inspected and maintained properly. For travel lift crane operators, they are required to be trained in the safe use of boat travel-lift and be qualified to operate the crane. Check the engine oil level and any unusual sound. Check that slings and winches are in proper working conditions. Check that the wire cable is not frayed or kinked. Check the lifting shackles to make sure they have safety split pins in place. Check the tires to ensure they are properly inflated. Since the boat travel-lift crane is applied in or near corrosive salt-water environments, a number of methods can be taken to protect the equipment and its components from corroding. Use anti-corrosion materials to build the crane, such as stainless steel tubing, motor and other components. Galvanizing the steel can provide better corrosion resistance. Paint the boat crane lift with superior primer and top coat. Take a preventive as well as ongoing maintenance for longer working life. The boat crane lift produced by our company is built with the latest technology and optimal design that provide customers with the benefits of reliable performance, long working life and utmost cost effectiveness. We are dedicated to solving any problem you have with the vessel handling and providing quality products and reliable services. Our travel-lift falls in a variety of types for you to choose from, such as mobile boat hoist, electric boat lift, hydraulic boat hoist, yacht lift, sailboat lift, remotely controlled travel lift and cabin controlled travelift. Engaged in material handling industry for more than 10 years, we have had a wealth of experience with respect to the crane solutions, support and service, making us reputable among our customers. 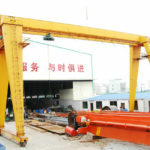 Interested in travel lift crane? contact our sales team today!